Per the plan I started off quickly. Since I did a warm up swim earlier, I had no anxiety, no moments of having to catch my breath. I just felt strong and steady – I enjoyed this swim. Most of the swim was clear, and I wasn’t really bumped, kicked and shoved. Two races and two fairly clean swims. I can’t get used to this. I soon was noticing different caps in our midst. I know not to lull me in to a false sense of “I am swimming to fast” based on that. I know I am a front-middle-of-the-packer with my swim. As I swam I kept what I believed were strong strokes. I felt good – not over-kicking. I noticed the number of athletes in the water literally dragging the bottom third of their body. I know my form is far from perfect, but it is interesting to note the form of other athletes for me. It does help to make me aware of my form, sometimes. After the first turn I felt like I was swimming such that I should head inside the buoys, and yet I actually had to keep a close watch as I actually swimming away from them. It felt almost strange – I had to push to keep the angle in towards the buoy line. I enjoyed this swim. And it went quickly. In my brain I thought I had beaten 35 minutes. I was feeling good. And then I started to get out of the water and saw the clock – it had been 37 minutes. 37 minutes??? I felt deflated….I had felt like I did well. There went some hope of beating last year’s time. It was depending on a strong swim, especially since I am still rebuilding my run. It was hard to not let that get the better of me. 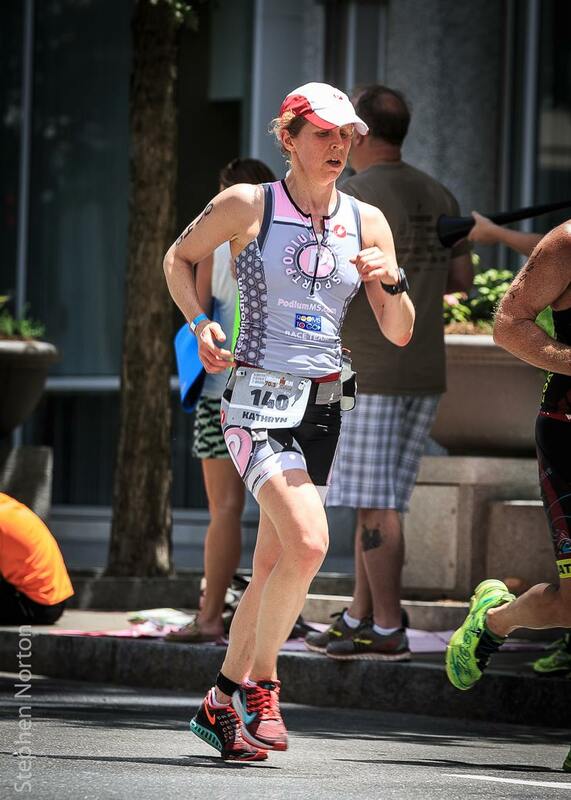 I had to shake it off….up next was the bike, and I had a goal for that as well – to do better than last year. And that would take all of my focus. T1 was quick – run up to my bike, helmet (with visor) on so no fiddling with sun glasses. Shoes on. Grab my bike. Stop for sunscreen and to the mount line. Off I went. First thing I noticed when I started riding was my heart rate was high – 150’s. This never happens. However, my power was good. I opted to stick with the power, knowing my heart rate would settle. And it did – at around 15 minutes and over the next 10 minutes slowly settled down from the mid to low 140s. I may have let it go too long being elevated, but by mile 15 it was where it should be – low 140’s. They had changed the course slightly due to construction, and it included a u-turn on Seaforth road – a narrow section. I can pull u-turns, but they are slow, so I knew I would unclip to pull it faster, which I did. It was here that I first saw Carlos, as well, which made me smile. Left was my word for the day. I knew I had about 5 age group waves behind me so I did glance back before passing, and didn’t remain on the left for the most part like at Chattanooga, but I did also spend a lot of time passing people. The bike course is a challenge, but a fun one. This is one where you don’t go by speed but power, heart rate and rate of perceived exertion. Last year this was the one race I didn’t hit 20 mph, and I knew I could do better. The first 10-15 miles are slight, long hills and a great straight away as you cross Lake Jordan. You literally fly. At about mile 15 or so I hit the head wind, and boy was it strong. I didn’t recall it from last year, but will remember it after this year. Yikes! Lots of good rollers and fun (even with a head wind) through about mile 33 or so, and then there are some bigger descents and climbs that make for a challenging final 1/3 of the ride. I had my nutrition plan and stuck with it, even a little ahead of schedule which is actually good. I know I can do this, and as my coach reminds me, I just need to fuel it. Somewhere I saw Abby, and passed her. She looked great. Like I said, she is an amazing athlete, and a phenomenal swimmer. Due to illness she had no reserves so to speak, and was looking strong and kicking tail out there. Twice I had to pass cars (on their right) who were stuck in the race, driving slowly, and hugging the center line. I really don’t know the protocol. In Chattanooga I passed a couple of hapless cars that got in to the race on the right as they hugged the shoulder, and a car or two I did pass on the left. In Raleigh the drivers had a command of knowing what to do – hugged that center line, drove VERY slowly leaving plenty of room behind the closest rider to them, and leaving me enough room to pass on the left ample room for me to zip left and pass any riders the car was trailing. In my mind I thought of it as “threading the needle” and was glad I practiced riding the white line on the road. I think if I ever got “caught” in a race as a driver of a vehicle, I would find the closest way to get off that road and reroute myself – it seems way too stressful of a thing to get stuck in a triathlon while driving a car. I started to feel my efforts somewhere after mile 40, but didn’t worry. I knew I could do this, and kept my power, for the most part, up. However, with a net down-hill, there was some drop in power. I also reminded myself that I was comfortably uncomfortable…which is OK.
What amazes me about this course is that you are biking along for about 54 -55 miles or so and it is very rural. 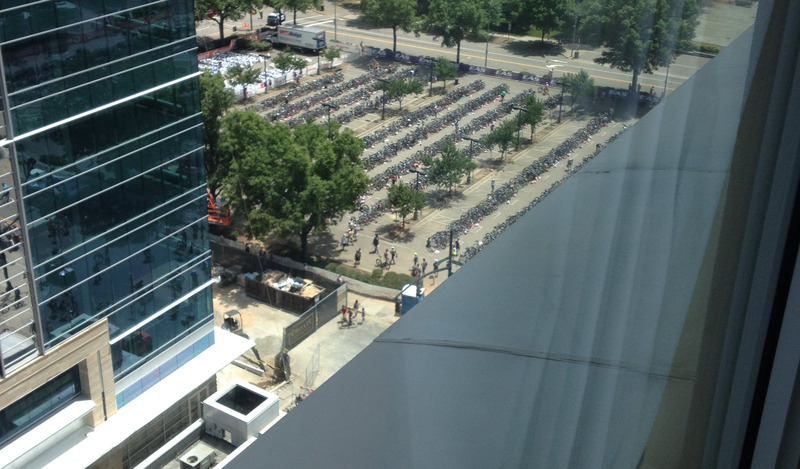 And then all of a sudden – hello – you are in downtown Raleigh getting ready to go in to transition. It really is that fast. At mile 55 a little something happened – I threw up on my bike. As it down my elbow pads and down the frame – a fair amount. This really surprised me as I didn’t feel any GI distress at all. I think it was just the heat of the day starting to hit me. I wasn’t worried, and just knew it meant Coke, ice, and water were my main priorities once on the run: I needed to burp, cool my body, and remain hydrated. I did take on a little more nutrition before heading in to transition. I really felt fine in terms of my stomach. I was feeling the heat, and was wondering what the run would hold for me. I kept reminding myself I can run strong, and that slow and strong are not always separate things. This year I did not try the flying dismount. And given that my transition spot was so close to the entrance, it wasn’t really worth it anyway. OK – so there is a bit of fatigue. I knew this transition was slower than it should have, but at least it wasn’t abysmal. Riding gear off – running gear on, and I was off. I grabbed my sunscreen, and also stopped at the volunteers spraying people down. I should have applied my own as well as the spray didn’t get rubbed in and that means you are exposed but…lesson learned. Once out on the run I felt the heat. I came to the first aid station and grabbed water (they didn’t have Coke at this first aid station), a cold sponge (no ice there either) and put it down my back. The Coke would have to wait until the next stop. I tried the nutrition on my race belt but it was so hot it was rancid. Change of plans – use the Gatorade at every aid station – no ifs ands or buts. Luckily I can handle most standard nutrition, I just prefer my own. And carrying my own also keeps me out of some of the aid station congestion. Not this time around! It was a hard run. 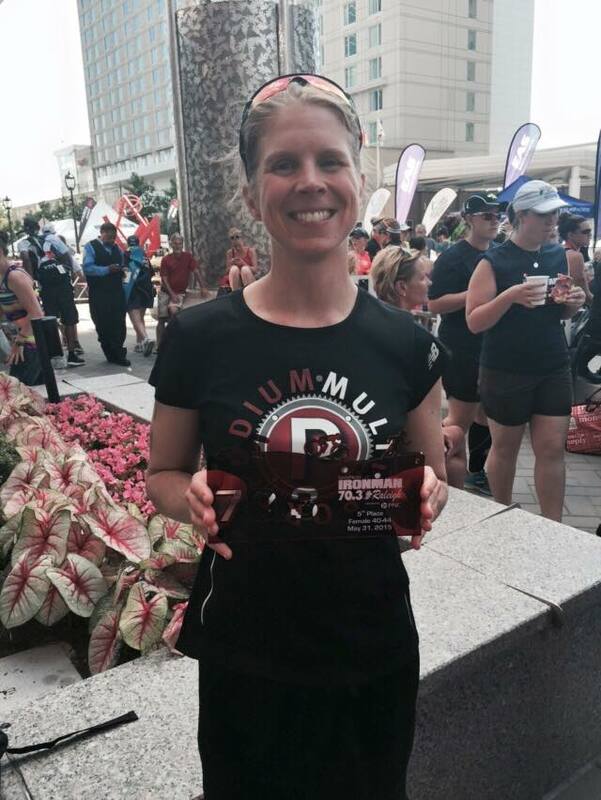 For me it was a slog fest, and the slowest half I have run in….a long while. The good news is I had no problem keeping nutrition down. However, the volunteers were having a problem keeping up with the demand for water, Gatorade, and anything else. I got slowed down behind people reaching for nutrition, and actually had to almost stop (and reach back) to get water or Gatorade. And all of it was, for the most part, warm. At least it wasn’t hot like what was on my belt but…yeah. At one point I was passing an athlete when friends took a picture of him at the same time I was dumping a cup of ice down my shorts. I told him if I was in the frame it would make for an interesting picture! He laughed. For the record, I never thought “I won’t make this”. I felt like I could keep a decent run. But, it was slow. And my heart rate was high. Likely it was the heat. Heat normally doesn’t get me, but this really was the first hot run I have had. It takes some adjustment. On the way back in on the first loop I passed Carmen. She was having a rough day and not keeping nutrition down. Since it is an out-and-back I also saw Abby about 5 minutes behind me. She cheered me on this go round, and I kept my slow and steady progress forward. I hit the turn around and went back out for more. I knew I would finish, and felt slow but solid. How high my heart rate was really did surprise me though. Soon I was looking at the mile 10 marker, and a mostly downhill run home. It was still slow, but I never gave up. The funny part is I had read Susie Kelley’s blog the night before about lessons she had learned at Raleigh last year, and not that I am one to give up, but it was a fresh reminder that determination can do a lot, and don’t give up no matter what. And I kept pushing for this race. I never saw Carlos on the run, and soon I was coming in to the finish. I saw a woman ahead of me about 0.5 miles out in my age group. Since we were in 2 waves I do not know if she was ahead of me or if I was passing her. I decided to pass her early, and hope she didn’t fight back. I kept pushing my pace, not looking back, but listening. I had no clue where I was in the rankings for my age group, but I wasn’t going to give up either. I still had fight (which, was a good thing as I think she finished 1 place behind me by 25 seconds). (Why can’t I push like that during the regular part of the course? Alas, it will come) I headed in strong. Once across the finish line I saw Carlos and his cousin Greg. I chatted with them over the fence, and then headed to the athlete food tent. I didn’t feel like eating, but grabbed food for later. The finish line was literally at our hotel, so we headed inside, and Carlos got me some chocolate milk which hit the spot. We sat in the lobby chatting, and I cooled down. Then I was able to eat. Carlos looked and we found out I had placed 5th in my age group. I was incredulous. I was 8 minutes slower than last year (when I placed 12th in my age group), and now was 5th? It really was a rough day on the run for many people. This race was a mixed bag. I was disappointed with the swim, but everyone’s swim was slow – even Abby and Carmen who are amazing athletes (I know I have said this before but…it’s an accurate and well supported statement) and very fast swimmers, and between us was in line with what I would expect in a half iron race. The bike I had the goal to beat last year’s pace and I did. My NP was actually 1 watt less and I did over 0.5 mph faster, so I was pleased. I know I can bike strong and still have a solid run, even if Raleigh wasn’t where it happened. I was a bit disappointed as last year this was the run where I finally hit a sub 8 minute pace for a half iron. Not this year. But, I know this year is different, and I have different goals. And I am in a much better place physically with how much better my hamstring is. In fact, my hamstring barely bothered me this race until the last mile or so, and then it was muted. And afterwards it was only bit more sore for a few hours, and by dinner there was no difference. And that has me elated. My eyes are on being healthy for Louisville, and I am well on my way to being there. 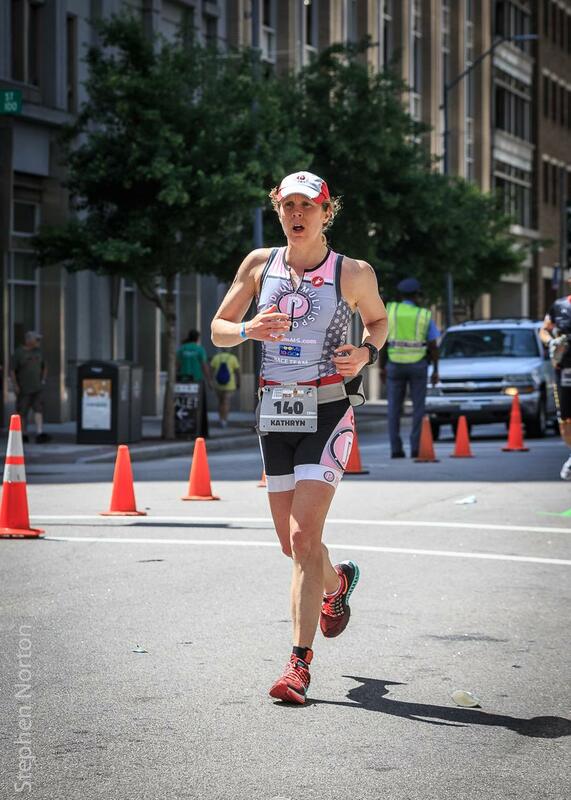 Also, after Chattanooga 70.3 I believed I had a better run in me…a stronger run. But heat and general fatigue took there toll I guess…as much as I loath to admit it. Nothing outstanding here….just slow and steady progress.